Have any questions, want to hire I Play Red or send a review copy of your game? Get in touch. Hell, want to play a game? want to hire me for any upcoming events as a demonstrator or event / booth staff. want to play a game ? ...or even if you just want to say hello. Please note we do not review Print and Play games, we get a lot of requests to review them and if we printed them all we'd never have time to play them all. If you want to send us a good quality prototype then we'd be happy to accept even if you need it back or shipped on. I played a scary amount of Magic the Gathering during the mid 90s and was travelling all over the UK playing at pro tour and pre release tournaments. I was, at the top of my game, the highest ranked female Magic player and first female judge. At Warp Con in Ireland I was reintroduced to board games through Settlers of Catan and Lunch Money. That began my addiction! I gave up playing Magic not long after and ditched mana for meeples. Over twenty years and several thousand games later...I currently run my own blog and social media presence promoting modern board gaming and regularly attend events and conventions as I Play Red or working as event staff for GamesQuest. 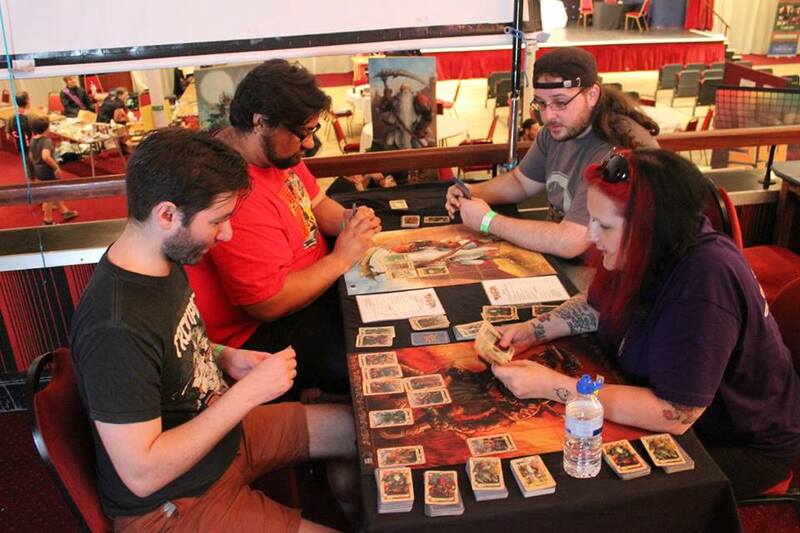 I have previously demoed with Esdevium Games, Mayfair Games, Black Box Games Publishing and Z-Man at some of the largest gaming events in Europe. I also work with numerous games companies and designers to develop and playtest their new games. For me, the heavier the game, the better but I will pretty much play any game you put in front of me! Party game through to gruelling 6 hour brain melters. Despite many prayers to the Dice Gods, they still hate me, and I'm not a big fan of player elimination. I have been attending Spiel, Essen since 2012. I have been travelling to the Dallas, Texas for BGG.CON for the past three years to meet some of my online US friends for games, met many new people (or should I say opponents) from around the world and even worked as part of Team Geek in 2017. I've attended Heavy Cardboard's invite only HeavyCon in Denver, Colorado and hope to return in 2019. I Play Red is my way of sharing my passion / addiction for board games with the rest of the world and hopefully help you find some new and interesting games along the way. If you see me at an event come and say hi, I'm pretty recognisable and if the red hair doesn't give it away look for the red meeple on my right wrist, yes, I Play Red.